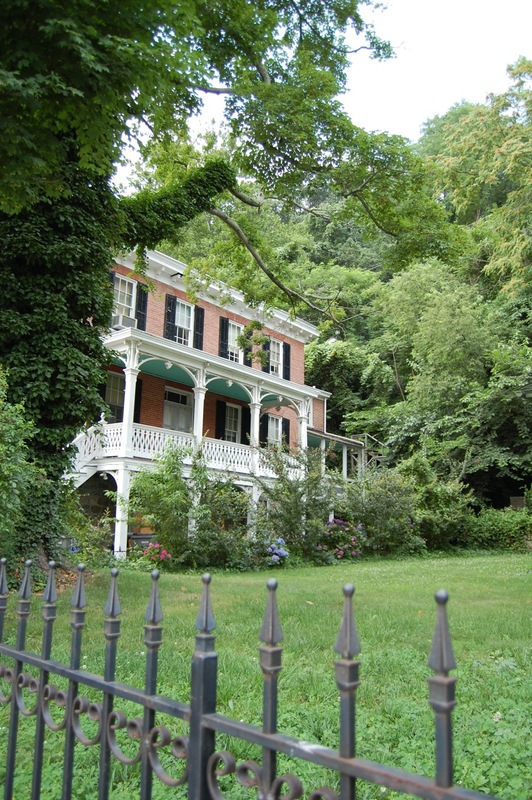 Since we moved to Delaware, looking at houses has become sort of an obsession of mine. It didn’t help when I realized how close we are here to Maryland, and beautiful Fair Hill with its horse farms and farm farms. 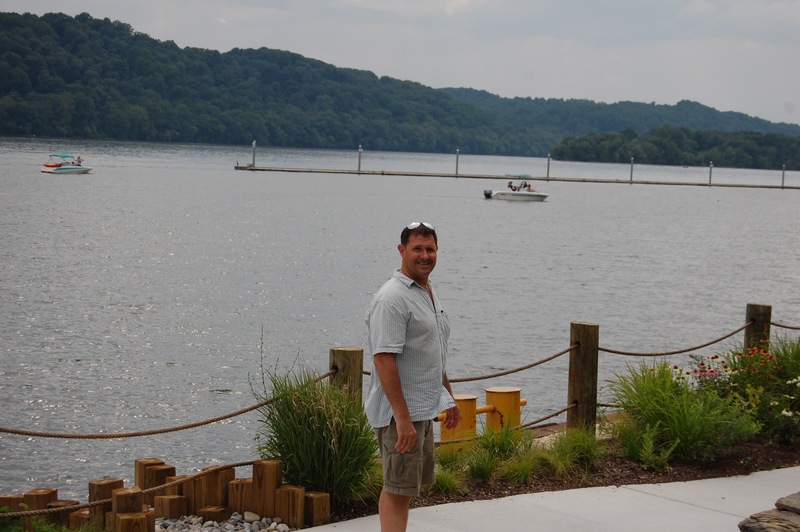 Another breathtaking part of Maryland is the water: the Chesapeake Bay, the Susquehanna River, the C&D Canal, all combine to create miles of shoreline, right up against luscious green woods. All this beautiful potential has me frantically crazed, my fingers fly over the keyboard, scouring the internet for possible bargains. Would we like more land and less house? Better house and less land? Out in the country or bike to town? Go cheaper and get solar panels? Room for fruit trees? Be near the water? 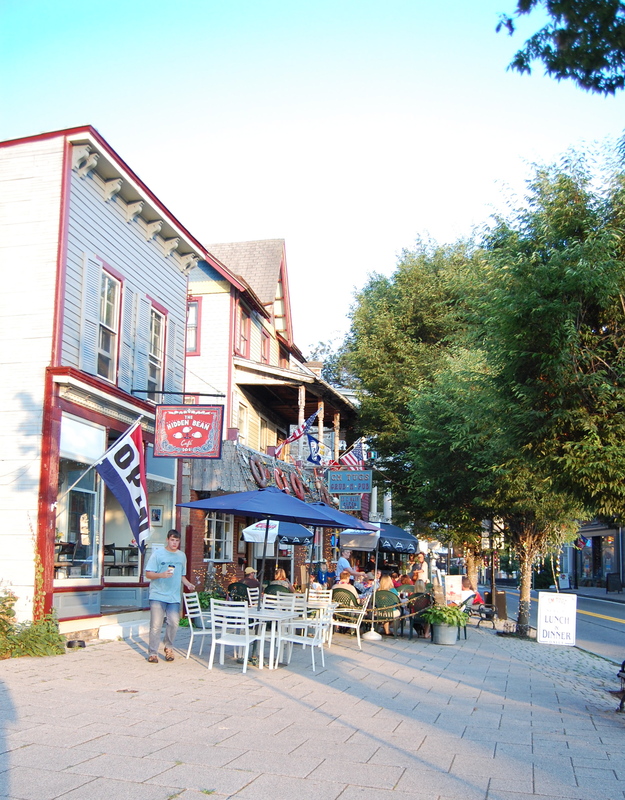 And of course, no search of an area is complete without physically seeing it, and I have been more than eager to drag Kevin to some of Maryland’s coastal towns. Maybe that’s why we ended up in Port Deposit. It wasn’t to look at houses per say, we really had a hankering for dinner by the water, but it would be untrue to say I wasn’t on a secret undercover mission as an ‘area sleuth’. 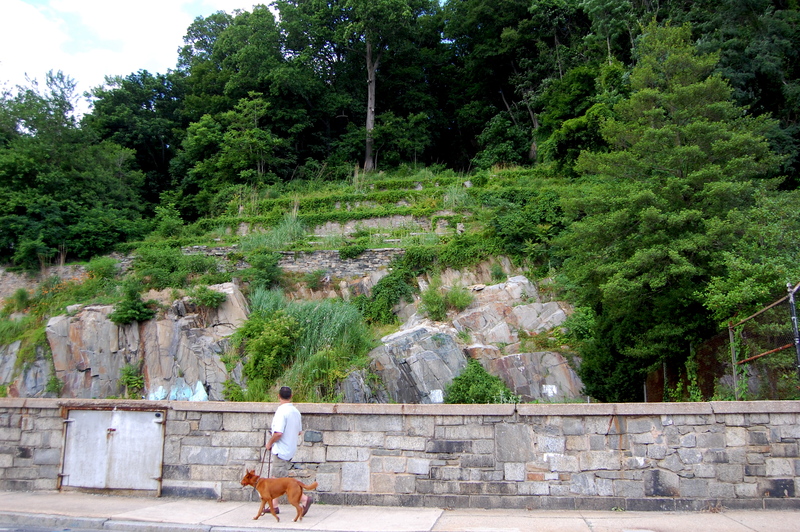 We pulled into town, admiring the tall cliffs and the narrow Main Street set between them and the Susquehanna River. The railway tracks also lay upon this small strip of land. 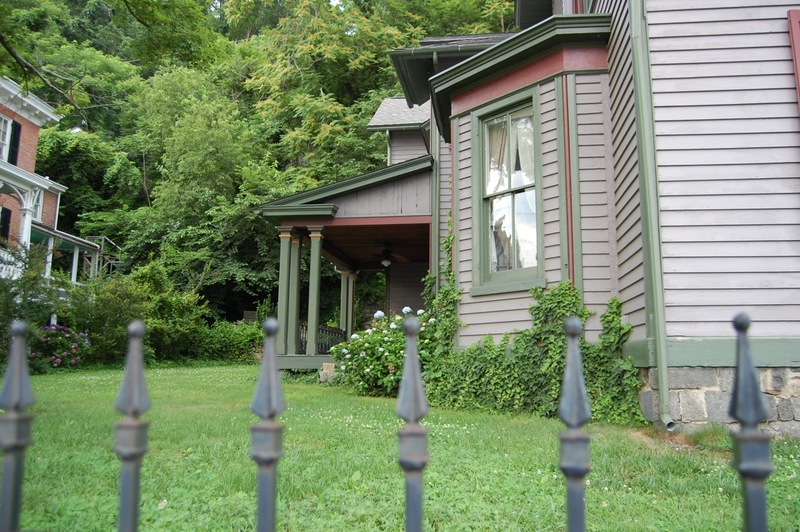 We passed several Victorian homes and a huge stone house with an iron gate. “Oh… I love that one!” Kevin gushed (okay, I think he would rather I say: Kevin noticed with manly appreciation). Kevin loves stone houses. I love stone houses, wood houses, any sort of house with character, you see. 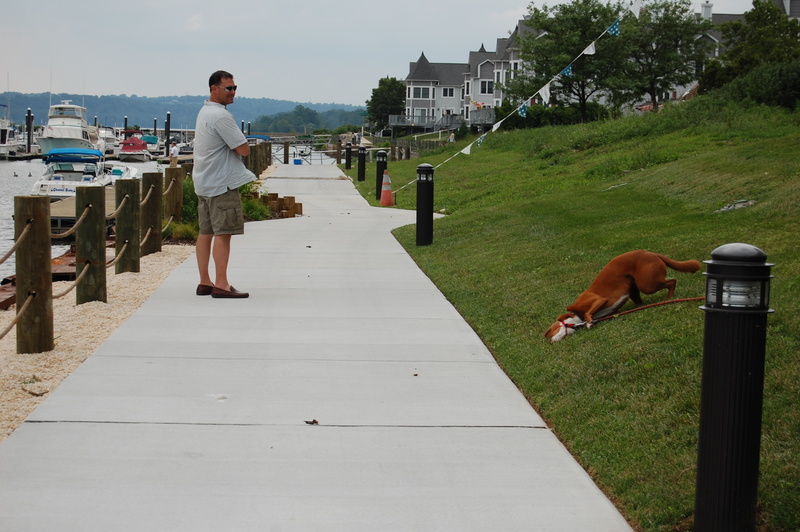 We found a place to park, and strolled along the water, where newer townhouses lined the shore. “This place is a real gem,” Kevin declared. I agreed. We headed back up through town, deciding to explore the elusive road heading to the houses at the top of the cliff. 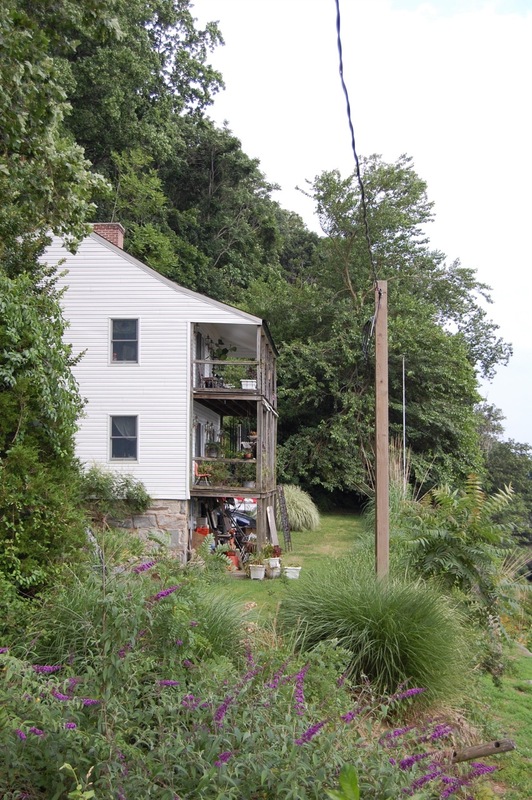 We were met at the top with a gorgeous view of the water, houses in various stages of disrepair, and a bubbling creek running down the hillside. “You like it?” the man smiled. “Well, I gotta house for sale right down there.” The man pointed. “That one right there? The stone one?” I asked. “Yep, that’s it,” he replied. “Kevin it’s the house you admired,” I screeched as if Kevin couldn’t already tell that from the conversation. 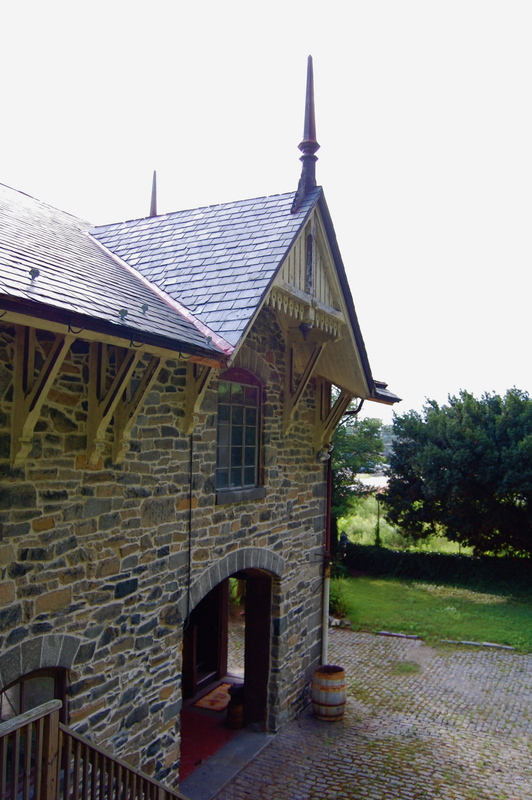 After a bit more talking about the house: why the man was selling… mother in nursing home, when it was built… 1860, what its original purpose was… a carriage house, who grew up there… this very man was born in one of the rooms! the man, shall we call him Bob?, generously offered to give us a tour. “I was on my way down the street to go do some shots. It’s been a long day on the water, but, hey, I got time.” From his pinkish nose, it seemed Bob spent a lot of time on this hobby, but that was his business. “Well, if you don’t mind…” Kevin and I agreed. Now this was a fun adventure. 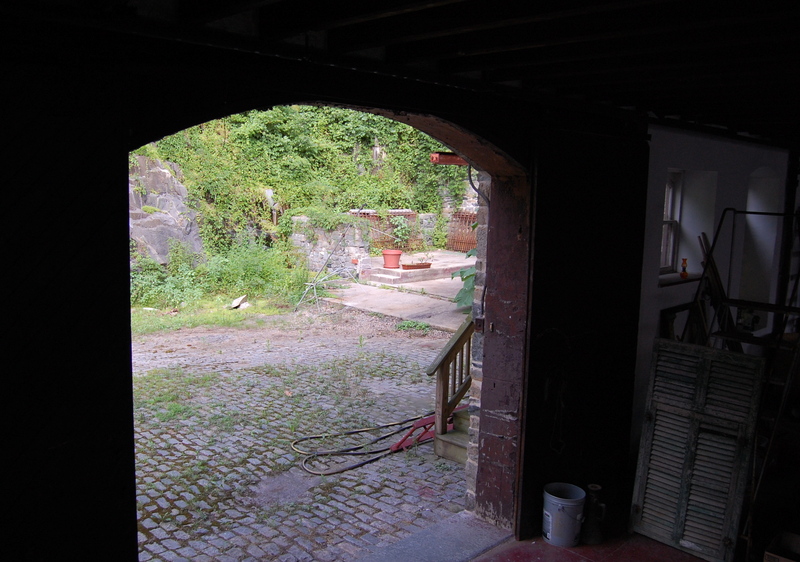 We happily “Ooohed and ahhed” as Bob opened the iron gate, admiring the cobblestone driveway, appreciating with all sincerity the arched door where the horses entered and the cement floor that was their stables and then for a time an auto shop. This was one giant room, sometimes used commercially, so much potential. “Eight thousand square feet of space in this house,” our host informed us. We headed upstairs, to the room our host was born. “Chamfered beams! 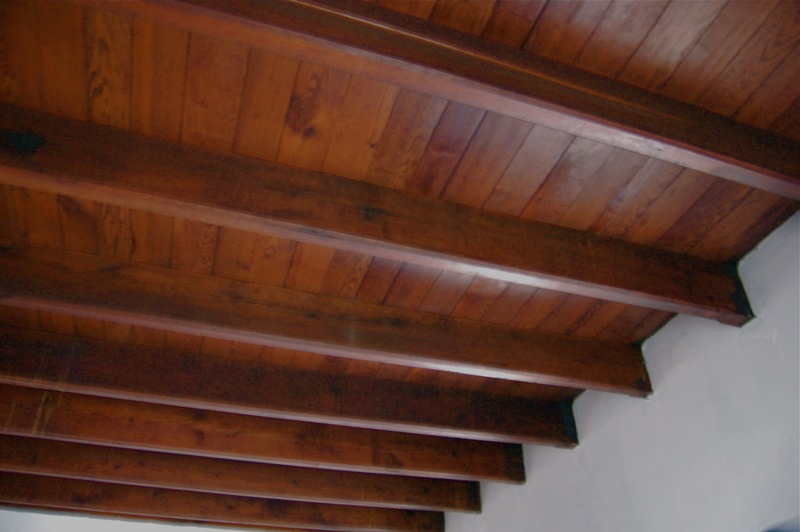 Do you see these wood beams? They don’t make them like this anymore! Take a picture!” Kevin drooled. We saw a bedroom, where the only new additions were some family made closets. We crossed the hall to the living room, covered in wood paneling, with a lowered ceiling. 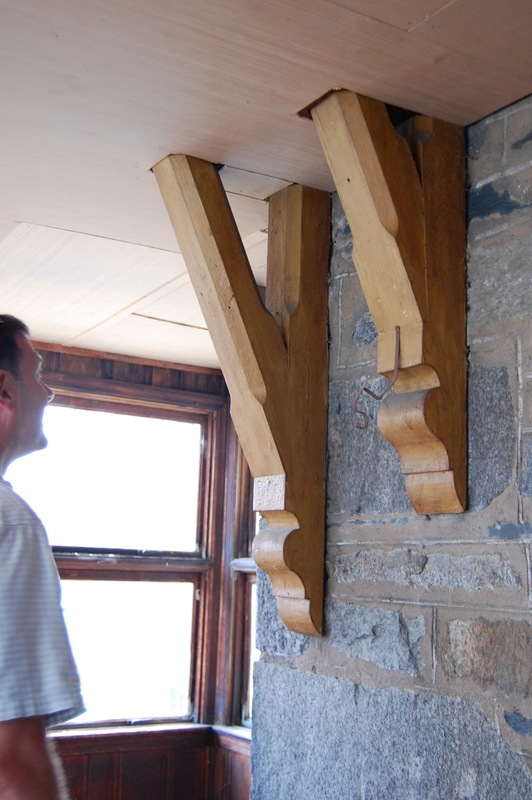 “You can take the ceiling out and it’s just like the rest with the wood beams,” we were told. 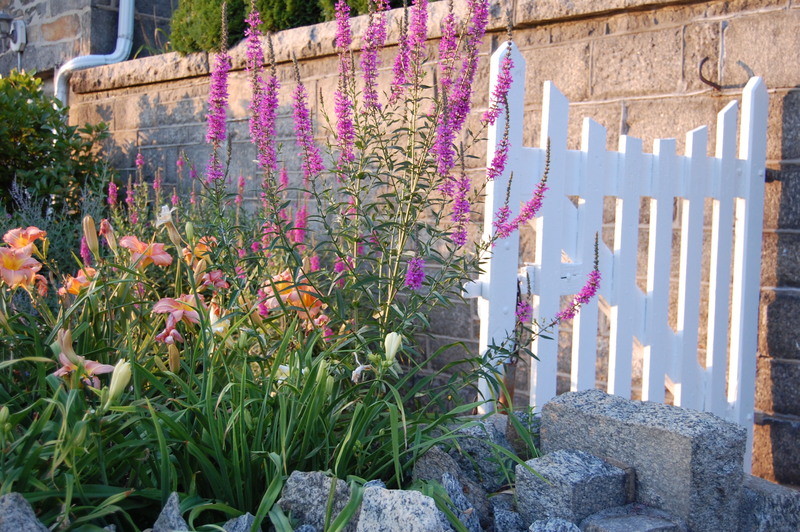 I oohed and ahhed at the intriguing possibilities of a DIY project to restore the beauty of a piece of history. I would even blog about it, maybe create an entirely new blog about the whole undertaking! Wouldn’t that be exciting! 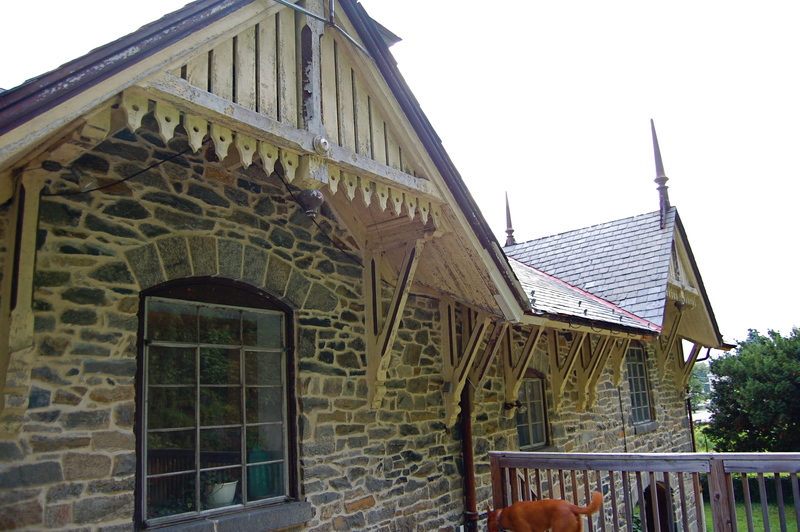 Then, we headed out to the porch, where we appreciated the wooden buttresses and heard the story of the time when our host almost had to blow up the nearby dam with dynamite. We agreed that would not have been a good scenario for the house or the town. “Oooh!” Two and a half acres of woods to explore? Nice. And plenty of room to garden on the trellises. 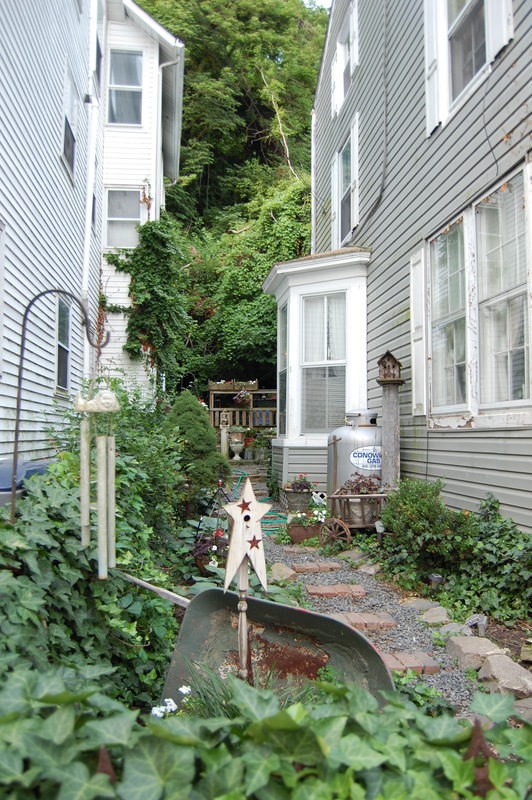 “I usually have it landscaped,” Bob said, “Looks much better then. 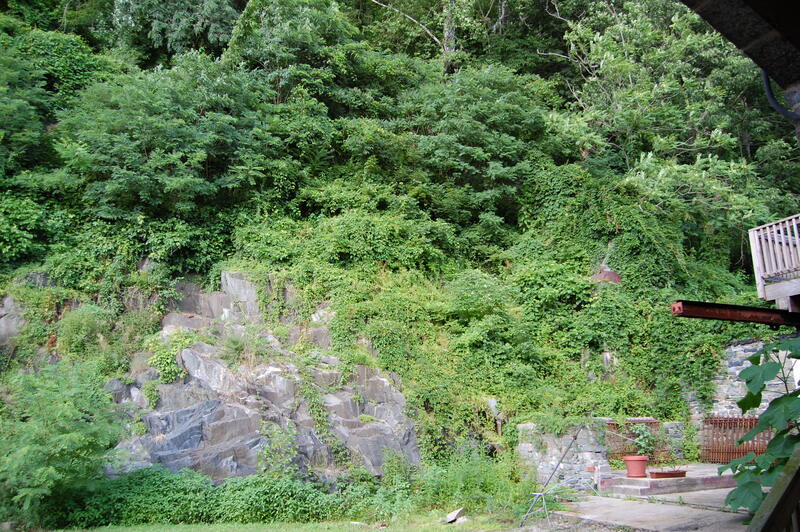 Now it’s all overgrown. And in the spring the water comes down off that hill; it’s amazing. They call it Cecil County’s Niagra Falls.” Well, that would be interesting to have in your backyard. Now, I’d done a little bit of prep work on Port Deposit before I’d come, and $600,000 sounded really high. Even $400,000 sounded kinda high, but I hadn’t really been looking at commercially zoned places. Was that it? We bid Bob ado, telling him we’d think about it. We found a nice little restaurant to eat outdoors, where our dog was welcome to lay by our feet. Over dinner I could hardly wait to get out my phone. If a house has ever been mentioned in history, I will find it on the internet. 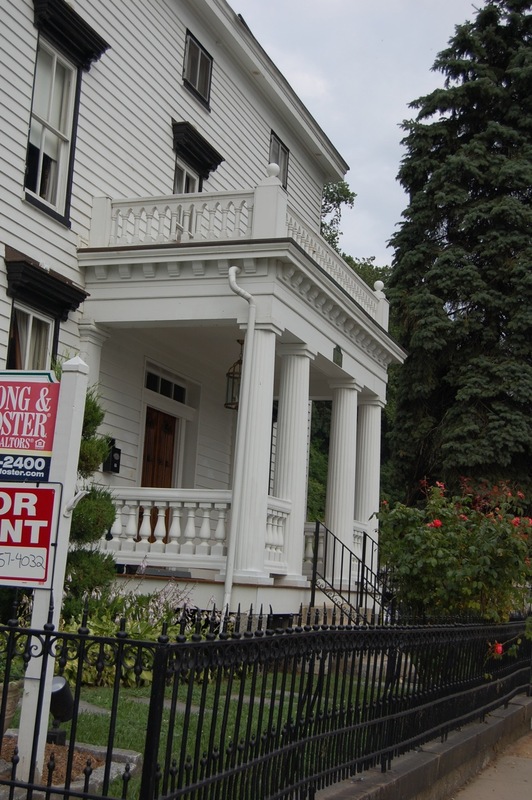 “Hmmm,” I said after I googled the address, “That house is listed on the market for $350,000.” Could it be true? Could dear Bob have made a mistake or…? “That’s why he didn’t want us to go to the real estate agent. He’s trying to make a fifty thousand dollar profit!” Kevin looked slightly disturbed. “And it’s not 2 and a half acres, it’s slightly less than one acre!” I said. “No long walk through the woods,” Kevin sighed. “And it’s not eight thousand square feet. It’s only five thousand.” I said, not that five thousand wasn’t plenty for us, but it currently only had two bedrooms. We enjoyed our meal. Our waitress was friendly and and the American Idol Show put on by the restaurant, entertaining. After dinner we decided to explore the rest of Main Street. 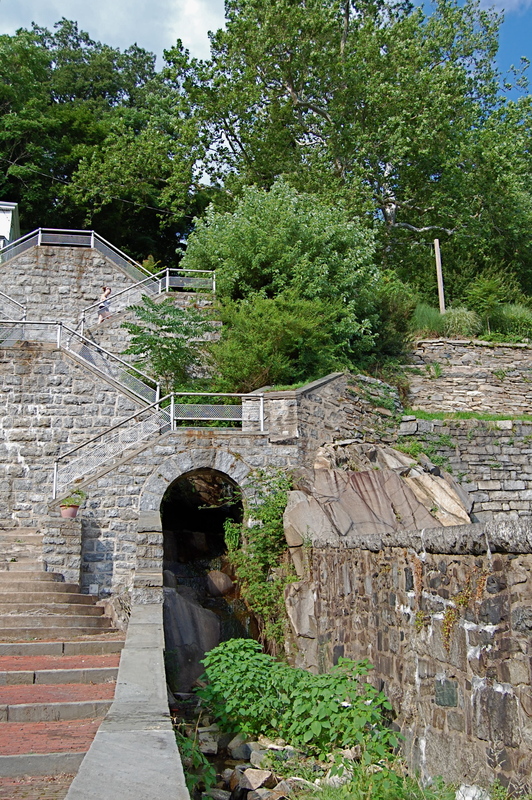 I enjoyed the pleasantly landscaped flowers, the old houses and the stone staircases leading up the cliff behind them. Our further tour of the town found many historical signs to read and an old Firehouse with the original bell still sitting out front. The shops were mostly restaurants, and there wasn’t really much past them. A bit further down Main Street, the houses got a little more worn, a little less concerned with upkeep, but so many of them old, historic gems. I still think a lot about the town’s potential. I’m sure it won’t be long before others fall upon this hidden gem and it remains hidden no more. 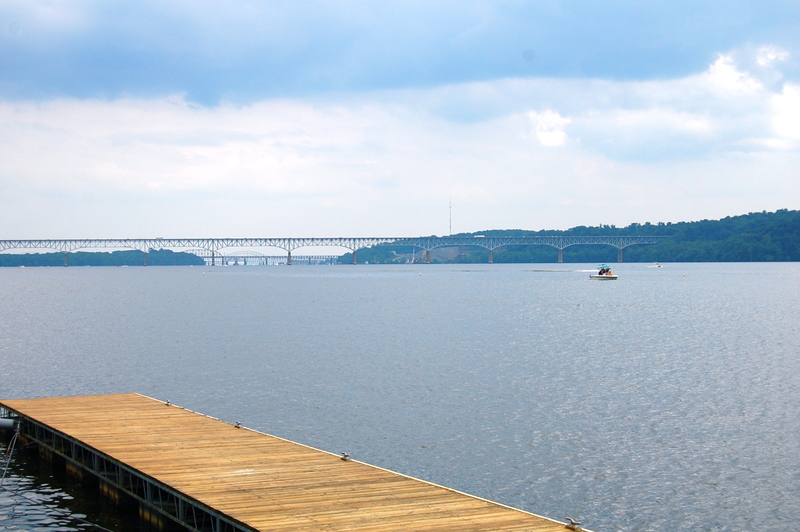 With the Aberdeen Proving Grounds expanding nearby, and beautiful towns like Havre De Grace as an example, it might only be a matter of time. Krista, I just wanted to tell you how much I appreciate your page here. 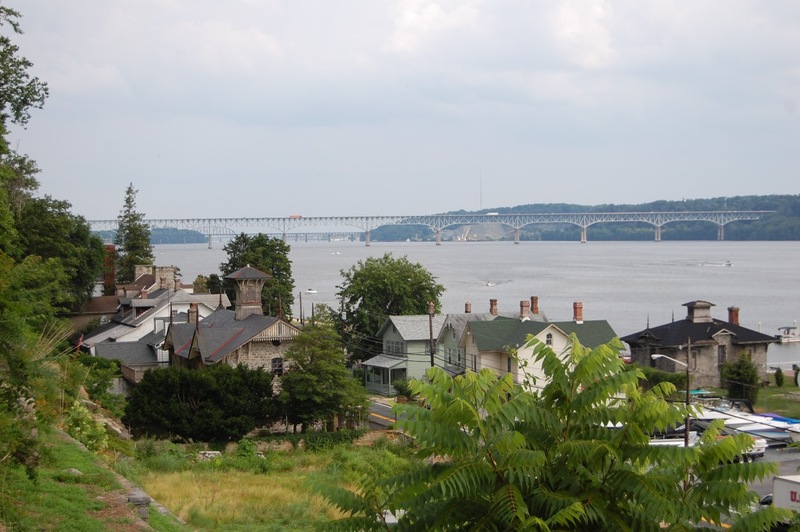 I found Port Deposit, MD by accident today and fell in love with all the history, charm, and character. I wasn’t sure if you were aware of this but two of the buildings you photographed were at one point used by the fire department. 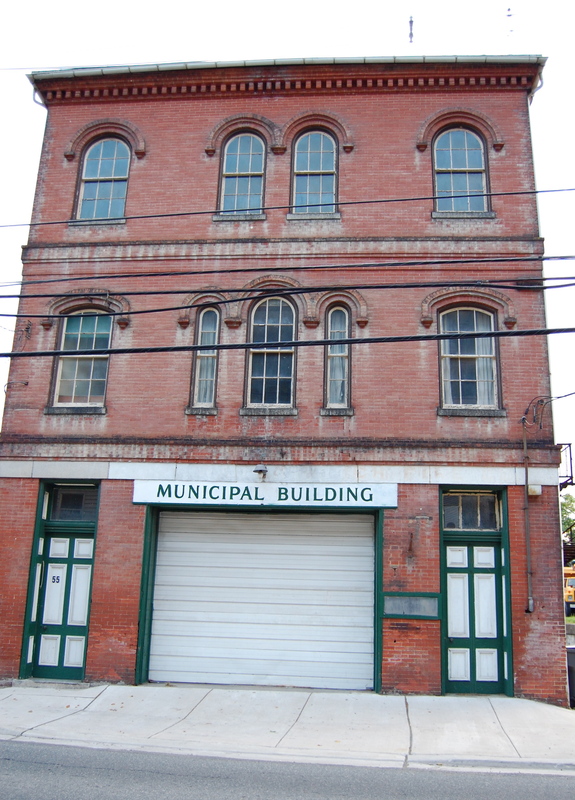 The old municipal building was built shortly after 1880 which was when the company organized (then under the name Goodwill). 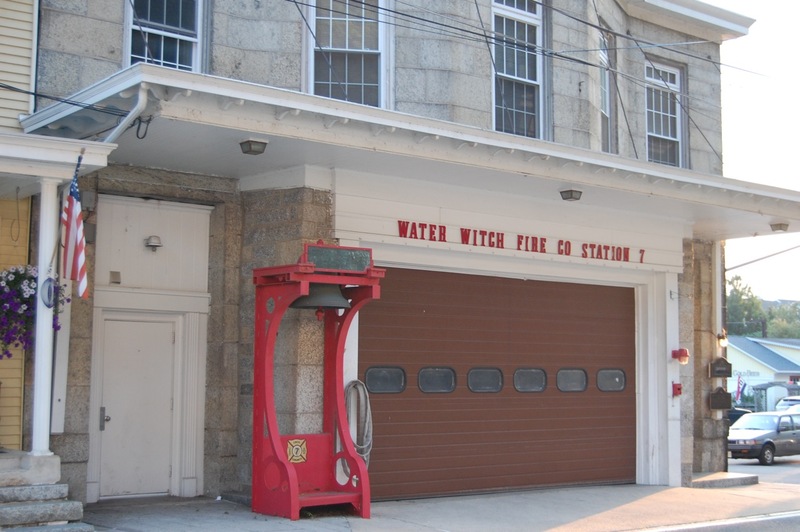 If you look directly above the current sign over the bay door, you can still make out part of the name Water Witch Fire Company, the name the company is now recognized as. 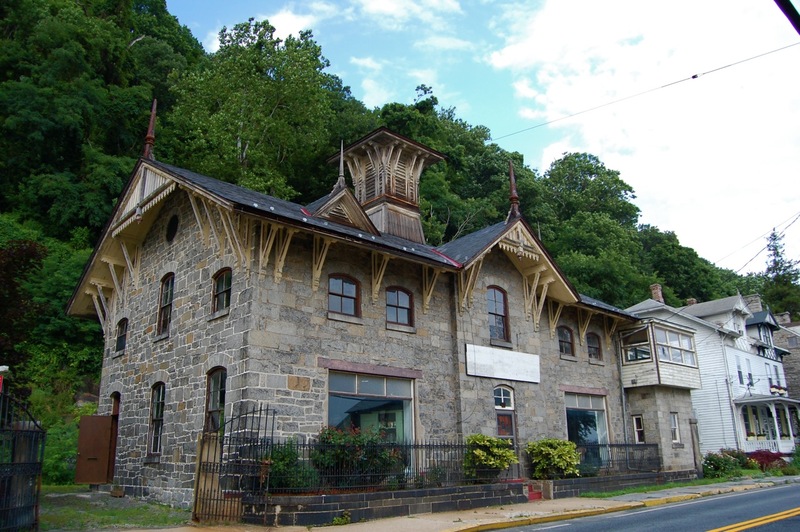 What’s truly interesting, however, is that many historic firehouses served other purposes aside from simply storing fire apparatus such as the post office, theater, and town hall. This particular building is no exception. 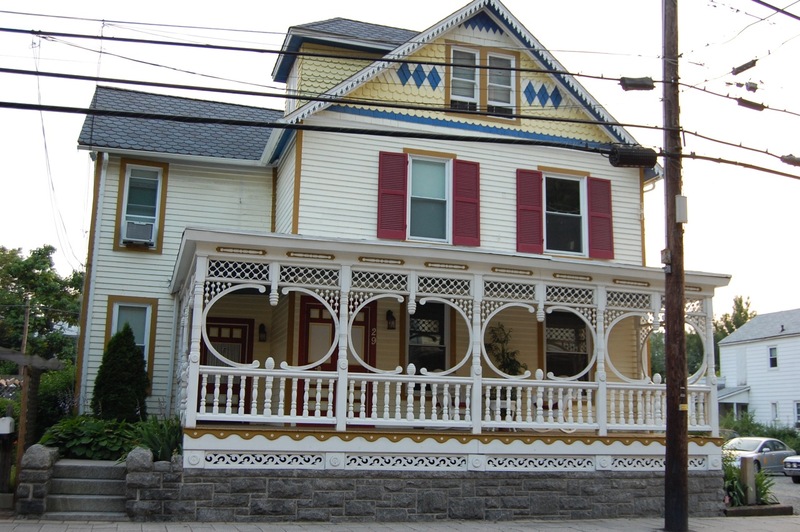 In addition to the Mason’s owning the third floor, you’ll see two small windows on the left side as you are looking at the front. 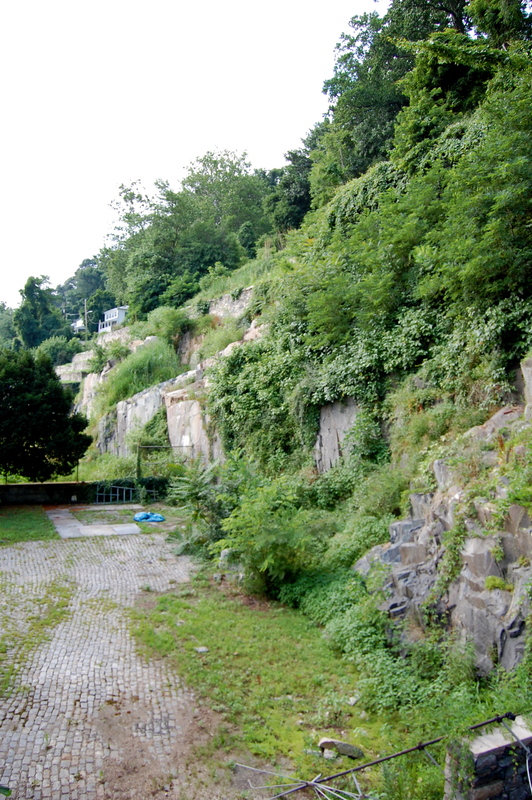 They are on the first floor facing an empty lot and playground. Within the frames are the rusted remains of thick bars for what I can only assume once served as individual jail cells. A wooden shutter still covers the one on the right. So if you ever find yourself if that town again and you don’t mind stopping by, I would love to read everything else you find! thanks so much for the fun Port Deposit information. 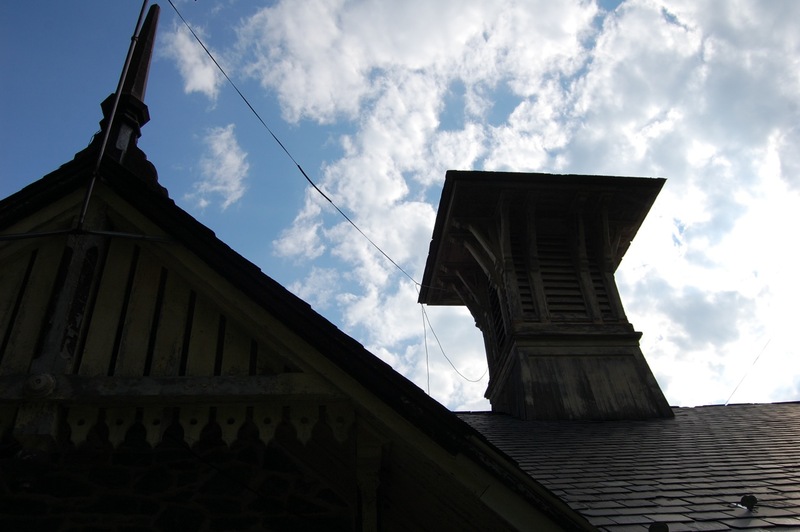 There is something intriguing to me about old buildings and the different uses they’ve had over the years. I would love to go back and check out the bars on the former jail windows. It occurs to me that it’s been nearly 3 years this month since our visit, so we are definitely overdue for a return. 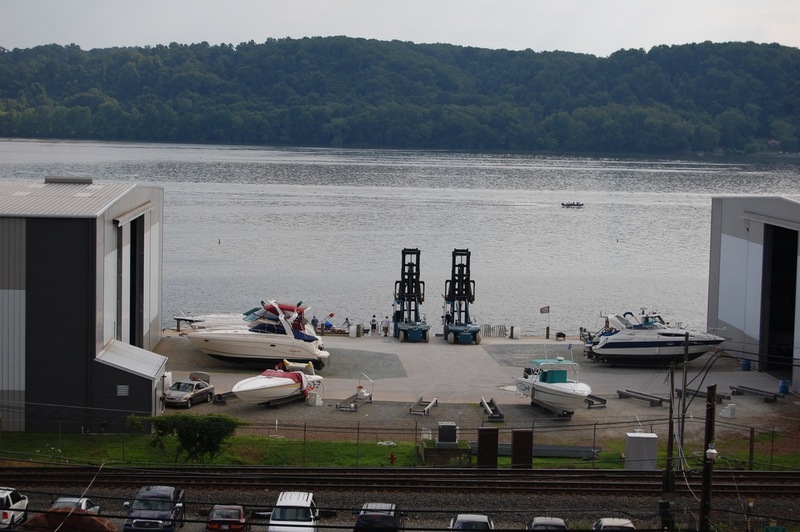 I hadn’t noticed the name “Water Witch” until now and find it to be quite interesting and wonder about it’s origins… thanks for checking out the blog & I look forward to checking out Port Deposit again on a cooler day or night this summer!